Uploading photos takes a long time on your favorite websites? 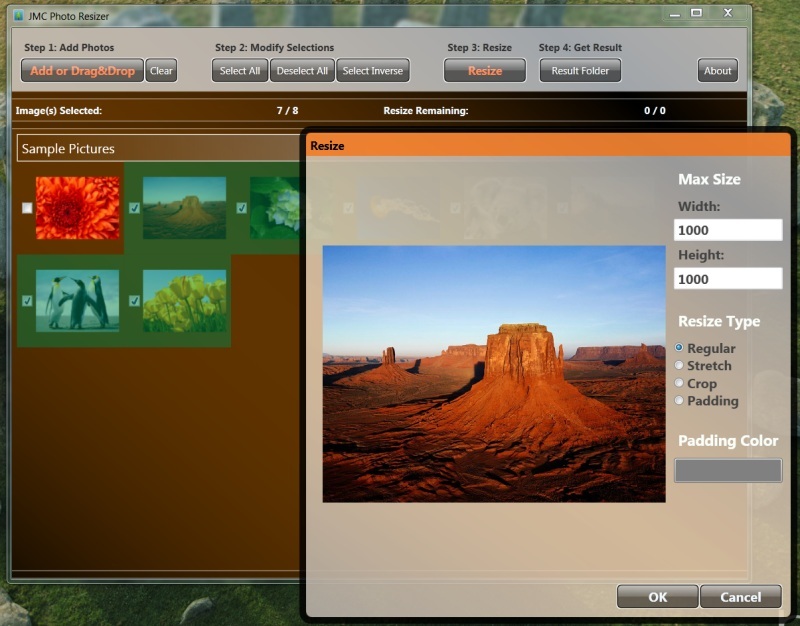 Want to resize many of your photos all together? Tired of resizing your photo one by one? Professional photo editing tool confuses you? You often accidentally resize the original photo unintentionally? You just want to resize photos and feel insecure about it? Uploading photos takes a long time? Better websites like SkyDrive will resize your photo before upload, which will be a lot faster. However, most sites will upload your super large photo and resize it later. It takes much longer to upload and you get the same smaller photo in the end. For majority of websites, resize photos using JMC Photo Resizer will save you a lot of upload time. You know how to resize a photo, but, too much work to resize 100 photos of yours? JMC Photo Resizer does it all in one batch. JMC Photo Resizer only does one thing, resize your photo. Simply drag whatever you like into the program and hit "Resize". Oops, you accidentally resized the original? Accident happens. You resized a photo for upload. Normally you did it right by keeping the original. However, today is your unlucky day or maybe you did it like X days ago; your original is gone. JMC Photo Resizer keeps accidents away. JMC Photo Resizer does not change your original photo. It always makes resized copy in its dedicated folder; leaving your original untouched. Don't know what are you doing? JMC Photo Resizer makes sure it is easy for you. If you ever mess it up, no harm will come to your original photos. Thus, feel free to explore around. Just don't throw stones at your computer, that's not what I meant by messing it up. Doesn't matter your photos are in landscape or portrait, you photos will always be smaller than the max size. This is easier because you don't need to care about aspect ratio and orientation at all. [Regular] maintains aspect ratio, longer side will be same as Max Size. [Stretch] self-explanatory, both sides will be same as Max Size. [Crop] looks like zoomed in, longer side will be cut to match Max Size. [Padding] similar to Regular, but, adds color on shorter side to match Max Size. When you use Padding Resize Type, you can set its color. Where is my resized photo? They are located in your picture folder in a folder called "JMC Photo Resizer". For easy access, simply click the "Result Folder" next to the Resize button.